Objective To investigate whether a dog’s superior olfactory sensitivity can be used to detect Clostridium difficile in stool samples and hospital patients. Design Proof of principle study, using a case-control design. Setting Two large Dutch teaching hospitals. Participants A 2 year old beagle trained to identify the smell of C difficile and tested on 300 patients (30 with C difficile infection and 270 controls). Intervention The dog was guided along the wards by its trainer, who was blinded to the participants’ infection status. Each detection round concerned 10 patients (one case and nine controls). The dog was trained to sit or lie down when C difficile was detected. Main outcome measures Sensitivity and specificity for detection of C difficile in stool samples and in patients. Results The dog’s sensitivity and specificity for identifying C difficile in stool samples were both 100% (95% confidence interval 91% to 100%). During the detection rounds, the dog correctly identified 25 of the 30 cases (sensitivity 83%, 65% to 94%) and 265 of the 270 controls (specificity 98%, 95% to 99%). Conclusion A trained dog was able to detect C difficile with high estimated sensitivity and specificity, both in stool samples and in hospital patients infected with C difficile. In daily practice, several factors delay the identification of C difficile infections. These include doctor’s delay (for example, the doctor does not consider the possibility of a C difficile infection, or decides to wait and see if the symptoms pass), inefficient sampling, and time required to process samples in the laboratory.13 14 As a result the mean time from onset of symptoms to start of treatment in studies ranges from 2.8 to 7.7 days.13 14 This can result in spread of C difficile infection by delaying appropriate infection control measures such as transferring patients to a single room. Screening all hospital patients at regular intervals could theoretically prevent delays in diagnosis but this is costly and impractical. In the 1970s C difficile was identified as the cause of pseudomembranous colitis.15 16 Since then, C difficile associated diarrhoea has often been described as having a characteristic smell.17 Sensitivity and specificity of the odiferous detection of C difficile by nursing staff are 55-82% and 77-83%, respectively.18 19 Dogs have a far superior sense of smell, however, which is thought to exceed that of humans by a factor of 100.20 We hypothesised that it may be possible for a dog to be trained to recognise the presence of C difficile in stool samples, or even in patients. If so, this could prove a valuable screening tool for C difficile infections in healthcare facilities. The dog used in this study was a 2 year old male beagle (fig 1⇓). A professional detection dog instructor (HL) trained the dog to identify C difficile in stool samples and, if this proved possible, in patients. A reward based training method was used in which the correct behaviour was reinforced, for instance by providing a treat. The dog was taught to sit or lie down if a specific scent was detected. He had not received previous training in detection. Training began by introducing the dog to the specific odour of toxigenic C difficile strains on culture plates. Wooden sticks were placed over the sample to absorb the scent emanating from the culture plates (often described as resembling horse manure9). Initially we left the sticks in this position overnight, but eventually the exposure time was shortened to around five minutes to reduce the strength of the scent. Early recognition of the scent was achieved by using simple search and find games, which were gradually replaced by exercises of increasing difficulty, for instance by using sticks with a fainter smell (that had not been exposed to the scent as long). Also, the scent was presented to the dog on materials other than the sticks, such as paper, fabric, and metal, and in different environments such as a kitchen, forest, or petrol station to vary background odours. The next step of training concerned discrimination between stool samples that were positive for toxin producing C difficile strains from those that were negative. Again, rather than the dog having direct contact with the stool sample, we presented the scent in various forms (absorbed on a wooden stick or on fabric, sample contained in a plastic vial, etc). After two months’ training we formally tested the diagnostic accuracy of the dog on stool samples. Finally, we explored the dog’s abilities to detect C difficile infection in patients admitted to hospital. For training purposes we used clinical isolates of toxigenic C difficile strains, cultured on standard media under anaerobic conditions. We used stool samples that were sent to the microbiology laboratory to test for C difficile and other infectious causes of diarrhoea. Samples were considered positive for C difficile if toxin was detected by enzyme immunoassay (VIDAS Clostridium difficile A & B; BioMérieux, France) and culture revealed a toxigenic strain of C difficile. Negative stool samples were those that gave negative results in both tests. We excluded samples with inconsistent results (for example, negative result for toxin by enzyme immunoassay but positive culture result, or an undetermined toxin enzyme immunoassay value). We further explored the dog’s ability to detect C difficile infection on the wards of two hospitals in Amsterdam: VU University medical centre (a tertiary clinical care centre) and St Lucas Andreas Hospital (a large community hospital). Between September 2010 and May 2011, we screened for inclusion consecutive patients who had a positive result for toxin by enzyme immunoassay in their stool sample. We aimed to include 30 patients in total. Both hospitals use an enzyme immunoassay plus a toxigenic culture to diagnose C difficile infection; however, the community hospital uses an enzyme immunoassay by a different manufacturer (ImmunoCard Toxins A&B; Meridian Bioscience, Cincinnati, OH). Eligible cases had symptoms of diarrhoea and both a positive result for toxin by enzyme immunoassay and a toxigenic C difficile strain detected by culture (in a sample taken less than seven days before the detection round). We defined diarrhoea as three or more loose or watery stool passages a day. We excluded children and adults on intensive care units or haematology wards. Patients with a first relapse after completing treatment for a previous C difficile infection were eligible but not those with subsequent relapses. Because the availability of the dog and trainer could not be guaranteed every weekend we excluded patients with positive test results during the weekend. For each case we approached nine control patients. These patients were on the same ward as and in close proximity to the index patient. Control patients did not have diarrhoea, or had diarrhoea but a negative result for C difficile toxin by enzyme immunoassay and culture (in a sample taken less than seven days previously). All participants (n=300; 30 cases plus 270 controls) gave informed consent. We formally tested the dog’s diagnostic accuracy on 50 stool samples with known positivity for C difficile and 50 with known negativity after completion of a two month practice period. To avoid the possibility that the dog simply recognised the odour of the sample rather than the odour being associated with the presence of C difficile, we did not use the samples that had been used during training. The scent of each sample was again absorbed onto different materials, which were then repeatedly (10 times) presented to the dog in different environments and at different concentrations. We considered a result to be positive (or negative) when it consistently provoked the same positive (or negative) response. If a sample provoked a mixed response (≤8/10 consistency: for example, eight positive responses and two negative ones), we classified it as an inconclusive result. Next we evaluated the dog’s detection abilities in patients on the wards of the two hospitals. We prospectively included 30 consecutive patients with C difficile infection and 270 control patients. For each case and corresponding nine controls on the ward we organised a detection round as soon as possible, preferably before starting treatment or within 36 hours. During this round the dog, trainer, and a member of the research team simply walked past the beds of the 10 participants. The trainer classified the dog’s response as either positive (dog sat down), inconclusive (dog showed excitement, took extra time without actually sitting down), or negative (dog showed no particular interest). We assumed the dog would be able to identify the patient with a C difficile infection by smelling the air surrounding the patient (independent of a patient’s bowel movements or personal hygiene), so physical contact was unnecessary and avoided. If there was any doubt, the round was repeated once. The trainer was not aware of which patients had C difficile infection. We consulted the hospital’s infection control committee to discuss the potential hazards of allowing a dog in the hospital. In accordance with recent guidelines, special attention was given to hand hygiene, making sure that staff and patients washed their hands both before and after contact with the dog.22 During detection rounds, the dog had no physical contact with patients, and contact with the environment (for example, bed, chair) was avoided as much as possible. The dog was not allowed in food preparation areas or on neonatal, haematology, or intensive care wards. The dog receives a health evaluation by a licensed veterinarian four times a year. He is not fed raw meat. He is trained solely for the purpose of recognising C difficile. When at work, he neither barks nor shows aggression, is easily recognised by his outfit (fig 1), and is always on a leash. The dog was presented with a total of 100 stool samples: 50 were positive for C difficile and 50 were negative. The dog gave a positive response to all 50 positive samples and a negative response to 47 of the 50 negative samples, with the remaining three negative samples recorded as an inconclusive response. In the primary analysis (interpreting inconclusive responses as negative responses), sensitivity and specificity were both 100% (95% confidence interval 91% to 100%). If an inconclusive response was considered as a positive result (secondary analysis), the dog’s sensitivity and specificity were 100% (91% to 100%) and 94% (83% to 98%), respectively. The supplementary video illustrates how the detection rounds were carried out. One round took place on a paediatric ward but the children became excitable by having an animal on the ward and distracted the dog. For this reason the round was not included and paediatric wards were excluded from the study. Thirty patients with C difficile infection and 270 control patients were included in the study. Table 1⇓ shows the characteristics of those patients. On the day of the detection round all 30 cases had diarrhoea compared with 16 (6%) of the controls. Stool samples from 35 controls (13%) were tested for C difficile on clinical grounds (presence of diarrhoea) in the week leading up to the detection round; these all gave negative results, although a non-toxigenic C difficile strain was cultured from two controls. All but three cases formally met the definition for C difficile infection. The first patient had symptoms of the infection and a positive result for toxin by enzyme immunoassay, but a culture was mistakenly not done. The second patient had symptoms and a positive result for toxin by enzyme immunoassay but an initial negative culture result, which turned out to be positive when repeated. The third patient had a relapse with recurring symptoms and a positive toxigenic culture result but negative result for toxin by enzyme immunoassay. Figure 2⇓ illustrates the diagnostic accuracy of the dog. An inconclusive response was recorded in seven participants: three cases and four controls. In the primary analysis (interpreting inconclusive responses as negative results), the dog correctly identified 25/30 cases (sensitivity 83%, 95% confidence interval 65% to 94 %) and 265/270 controls (specificity 98%, 95% to 99%). If inconclusive responses were considered as positive results (secondary analysis), the dog correctly identified 28 cases (sensitivity 93%, 76% to 99%) and 261 controls (specificity 97%, 94% to 98%). Table 2⇓ provides information on the occasions that the dog and the laboratory gave discrepant results (inconclusive dog responses, false positives, and false negatives). In some instances the dog was clearly distracted by unrelated stimuli (for instance, by being offered a treat). Other cases were less clear and it cannot be ruled out that the dog responded to diarrhoea that was not caused by C difficile (for example, control 7, table 2) or asymptomatic carriage of a non-toxigenic strain (for example, control 8, table 2). Of all 16 participants with diarrhoea not related to C difficile infection, the dog gave a negative response in 13 controls and an inconclusive response in three controls. It is feasible to use a dog to detect Clostridium difficile in stool samples and in patients. The dog’s diagnostic accuracy with stool samples suggests that immediate identification of C difficile is possible. Moreover, our data suggest that the same may be true for the rapid diagnosis of C difficile infection on clinical wards. For the purposes of detection the dog did not need a stool sample or physical contact with patients. 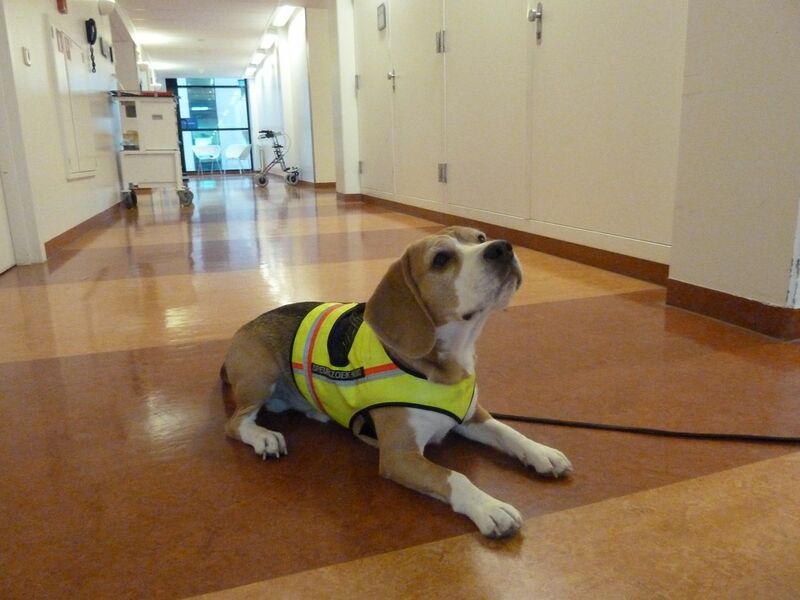 It would seem dogs can detect C difficile in the air surrounding patients. In addition, dogs are quick and efficient: patients in a hospital ward can be screened for the presence of C difficile infection in less than 10 minutes. This is the first report of animal assisted detection of C difficile. There have been several studies and anecdotal reports on olfactory detection in medicine, mostly using dogs—for example, to detect malignancies of bladder, lung, breast, skin, prostate, ovary, and colon.23 24 25 26 27 28 29 In nearly all the studies, however, the animals were exposed to biological samples obtained from patients and not to the patients themselves. In this study, culture was not routinely carried out on controls to screen for asymptomatic carriage of toxigenic and non-toxigenic C difficile. This is a limitation as consequently we do not know the percentage of asymptomatic C difficile carriers in our population and how the dog responded to them. Asymptomatic carriage of both toxigenic and non-toxigenic strains occurs in up to 18-30% of patients in hospital.31 32 33 34 This argues against a positive response by the dog. As the clinical relevance of detecting C difficile infection rather than carriage is far greater (both for the patient and for the prevention of transmission1 31), this was the focus of our study. Another concern is that the results are not easily generalisable because we used only one dog and one trainer. It could be that the findings would be less convincing for another dog or trainer. Although unlikely, we cannot rule out the possibility that our first and only experience was with an exceptional dog-trainer combination. Should more dogs become available in the future for detection of C difficile infection, trained animals would need an individual assessment of performance and regular practice to maintain their skills. A second limitation of using an animal as a diagnostic tool is that, as with humans, behaviour is not fully predictable. The dog’s reaction to other stimuli (for example, children’s play, being beckoned, being offered a treat) illustrates that, despite a high level of training, dogs are still prone to distraction. Another limitation is that we trained the dog in the hospital setting. Outside the research protocol we visited a few patients with C difficile infection on long term care facility wards. These cases spent much of the day in a shared living room and not in their beds. This proved more difficult for the dog. We hypothesise that in the hospital setting the bed is a strong source of smell because the patients are often bedridden and the mattress is more likely absorb odours. Patients in the community setting are often less confined to their room and bed. This could make odours more diffuse and more difficult to pinpoint. Also, the dog may have been conditioned to respond to the bacterium when a patient was in a hospital room (usually in bed). This may mean that detection dogs are less suitable for other settings such as nursing homes, at least without additional training. The use of dogs in hospitals might pose a risk to the dogs themselves, hospital staff, and patients. Dogs can be carriers of C difficile strains and other pathogens. Similar to hospital staff, the dog could be a source of transmission. This risk could be minimised by using strict preventive measures such as avoiding physical contact with patients and their surroundings. Unanswered questions remain, such as what does the dog actually smell—is it a certain quantity of bacteria, toxins, or other bacterial products? How does the dog respond to stool samples that are negative for toxin by enzyme immunoassay but positive by toxigenic culture, cytotoxicity assay, or nucleic acid amplification tests? And how does the dog respond to patients early in the course of the infection, or those with asymptomatic carriage of toxigenic and non-toxigenic strains? Does a positive response by the dog to a patient without symptoms predict disease? Can a persistent positive response by the dog after symptoms have cleared predict relapse, as suggested by the response to one participant (control 12, table 2)? Will the dog perform equally well in a high incidence setting—that is, during an outbreak, when several patients in one room could be affected? We intend to deal with these situations in future studies. How could a dog that detects C difficile infection be used in daily practice? With regular surveillance rounds (for instance to screen all wards in a hospital with a high incidence of infection several times a week, a “pet scan”) C difficile might be detected earlier. Early detection could overcome common diagnostic delays (lack of clinical suspicion, delays in sampling stool, and laboratory procedures) and lead to prompt hygienic measures and treatment. However, further studies will clearly have to examine whether surveillance can actually limit transmission and reduce the incidence of infection. For example, surveillance is principally different from the type of case directed diagnosis in this study design, because the dog cannot immediately receive a reward after a positive identification, potentially extinguishing the trained alert. In conclusion, in this proof of principle study a trained dog was able to detect C difficile with high estimated sensitivity and specificity, both in stool samples and in infected patients in a hospital setting. This finding could have great potential for screening for C difficile infection in healthcare facilities and thus contribute to the control and prevention of outbreaks. Contributors: MKB, MvA, CvdB-G, and YMS developed the concept and outlined the methods. HL trained the dog. MKB, HL, and MvV carried out the detection rounds and collected the data. MKB analysed the data and drafted the paper. MvA, CvdB-G, and YMS provided conceptual and technical guidance. All authors critically appraised the paper, revised where appropriate and approved the final version of the manuscript. MKB and YMS are the guarantors. Competing interests: All authors have completed the ICMJE uniform disclosure form at www.icmje.org/coi_disclosure.pdf (available on request from the corresponding author) and declare: HL is the owner and chairman of the Animal Behaviour and Cognition, Scent Detection Research and Academy HL&HONDEN, Edam, Netherlands; otherwise no support from any organisation for the submitted work; no financial relationships with any organisations that might have an interest in the submitted work in the previous three years; no other relationships or activities that could appear to have influenced the submitted work. Ethical approval: The research protocol was approved by the institutional review boards of both hospitals. Samore MH, Venkataraman L, DeGirolami PC, Arbeit RD, Karchmer AW. Clinical and molecular epidemiology of sporadic and clustered cases of nosocomial Clostridium difficile diarrhea. Am J Med1996;100:32-40. Loo VG, Poirier L, Miller MA, Oughton M, Libman MD, Michaud S, et al. A predominantly clonal multi-institutional outbreak of Clostridium difficile-associated diarrhea with high morbidity and mortality. N Engl J Med2005;353:2442-9. Freeman J, Bauer MP, Baines SD, Corver J, Fawley WN, Goorhuis B, et al. The changing epidemiology of Clostridium difficile infections. Clin Microbiol Rev2010;23:529-49. Rupnik M, Wilcox MH, Gerding DN. Clostridium difficile infection: new developments in epidemiology and pathogenesis. Nat Rev Microbiol2009;7:526-36. Kuijper EJ, Coignard B, Tull P. Emergence of Clostridium difficile-associated disease in North America and Europe. Clin Microbiol Infect2006;12(Suppl 6):2-18. Bauer MP, Notermans DW, van Benthem BH, Brazier JS, Wilcox MH, Rupnik M, et al. Clostridium difficile infection in Europe: a hospital-based survey. Lancet2011;377:63-73. Hensgens MP, Goorhuis A, van Kinschot CM, Crobach MJ, Harmanus C, Kuijper EJ. Clostridium difficile infection in an endemic setting in the Netherlands. Eur J Clin Microbiol Infect Dis2011;30:587-93. Muto CA, Blank MK, Marsh JW, Vergis EN, O’Leary MM, Shutt KA, et al. Control of an outbreak of infection with the hypervirulent Clostridium difficile BI strain in a university hospital using a comprehensive “bundle” approach. Clin Infect Dis2007;45:1266-73. Delmee M. Laboratory diagnosis of Clostridium difficile disease. Clin Microbiol Infect2001;7:411-6. Kufelnicka AM, Kirn TJ. Effective utilization of evolving methods for the laboratory diagnosis of Clostridium difficile infection. Clin Infect Dis2011;52:1451-7. Crobach MJ, Dekkers OM, Wilcox MH, Kuijper EJ. European Society of Clinical Microbiology and Infectious Diseases (ESCMID): data review and recommendations for diagnosing Clostridium difficile-infection (CDI). Clin Microbiol Infect2009;15:1053-66. Karre T, Sloan L, Patel R, Mandrekar J, Rosenblatt J. Comparison of two commercial molecular assays to a laboratory developed molecular assay for diagnosis of Clostridium difficile infection. J Clin Microbiol2011;49:725-7. Frenz MB, McIntyre AS. Reducing delays in the diagnosis and treatment of Clostridium difficile diarrhoea. Q J Med2003;96:579-82. Scheurer D. Diagnostic and treatment delays in recurrent Clostridium difficile-associated disease. J Hosp Med2008;3:156-9. Bartlett JG, Onderdonk AB, Cisneros RL, Kasper DL. Clindamycin-associated colitis due to a toxin-producing species of Clostridium in hamsters. J Infect Dis1977;136:701-5. George RH, Symonds JM, Dimock F, Brown JD, Arabi Y, Shinagawa N, et al. Identification of Clostridium difficile as a cause of pseudomembranous colitis. BMJ1978;1:695. Bartlett JG, Gerding DN. Clinical recognition and diagnosis of Clostridium difficile infection. Clin Infect Dis2008;46(Suppl 1):S12-8. Burdette SD, Bernstein JM. Does the nose know? The odiferous diagnosis of Clostridium difficile-associated diarrhea. Clin Infect Dis2007;44:1142. Johansen A, Vasishta S, Edison P, Hosein I. Clostridium difficile associated diarrhoea: how good are nurses at identifying the disease? Age Ageing2002;31:487-8. Issel-Tarver L, Rine J. The evolution of mammalian olfactory receptor genes. Genetics1997;145:185-95. Newcombe RG. Two-sided confidence intervals for the single proportion: comparison of seven methods. Stat Med1998;17:857-72. Lefebvre SL, Golab GC, Christensen E, Castrodale L, Aureden K, Bialachowski A, et al. Guidelines for animal-assisted interventions in health care facilities. Am J Infect Control2008;36:78-85. Willis CM, Church SM, Guest CM, Cook WA, McCarthy N, Bransbury AJ, et al. Olfactory detection of human bladder cancer by dogs: proof of principle study. BMJ2004;329:712. McCulloch M, Jezierski T, Broffman M, Hubbard A, Turner K, Janecki T. Diagnostic accuracy of canine scent detection in early- and late-stage lung and breast cancers. Integr Cancer Ther2006;5:30-9. Ehmann R, Boedeker E, Friedrich U, Sagert J, Dippon J, Friedel G, et al. Canine scent detection in the diagnosis of lung cancer: revisiting a puzzling phenomenon. Eur Respir J2012;39:669-76. Sonoda H, Kohnoe S, Yamazato T, Satoh Y, Morizono G, Shikata K, et al. Colorectal cancer screening with odour material by canine scent detection. Gut2011;60:814-9. Horvath G, Andersson H, Paulsson G. Characteristic odour in the blood reveals ovarian carcinoma. BMC Cancer2010;10:643. Cornu JN, Cancel-Tassin G, Ondet V, Girardet C, Cussenot O. Olfactory detection of prostate cancer by dogs sniffing urine: a step forward in early diagnosis. Eur Urol2011;59:197-201. Williams H, Pembroke A. Sniffer dogs in the melanoma clinic? Lancet1989;1:734. Lit L, Schweitzer JB, Oberbauer AM. Handler beliefs affect scent detection dog outcomes. Anim Cogn2011;14:387-94. McFarland LV, Mulligan ME, Kwok RY, Stamm WE. Nosocomial acquisition of Clostridium difficile infection. N Engl J Med1989;320:204-10. Samore MH, DeGirolami PC, Tlucko A, Lichtenberg DA, Melvin ZA, Karchmer AW. Clostridium difficile colonization and diarrhea at a tertiary care hospital. Clin Infect Dis1994;18:181-7. Clabots CR, Johnson S, Olson MM, Peterson LR, Gerding DN. Acquisition of Clostridium difficile by hospitalized patients: evidence for colonized new admissions as a source of infection. J Infect Dis1992;166:561-7. Shim JK, Johnson S, Samore MH, Bliss DZ, Gerding DN. Primary symptomless colonisation by Clostridium difficile and decreased risk of subsequent diarrhoea. Lancet1998;351:633-6.